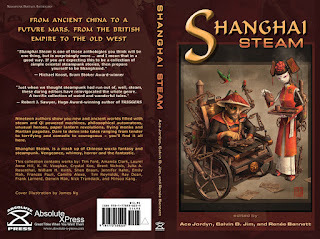 Here's the cover for the Shanghai Steam anthology that I am in. It was launched last weekend at World Fantasy, but I've waited until after the hurricane and that election thingy we just had to post about it. “Shanghai Steam is one of those anthologies you think will be one thing, but is surprisingly more…and I mean that in a good way. If you are expecting this to be a collection of simple oriental steampunk stories, then prepare yourself to be Shanghaied.” — Bram Stoker Award-winner, Michael Knost. “Just when we thought steampunk had run out of, well, steam, these daring editors have reinvigorated the whole genre. A terrific collections of weird and wonderful tales.” – Robert J. Sawyer, Hugo Award-winning author of TRIGGERS. Nineteen authors show you new and ancient worlds filled with steam and Qi-powered machines, philosophical automatons, unusual heroes, paper lantern revolutions, flying monks and Martian pagodas. Dare to delve into tales ranging from tender to terrifying and comedic to courageous – you’ll find it all here. Shanghai Steam, is a mashup of Chinese wuxia fantasy and steampunk. Vengeance, whimsy, horror and the fantastic. This collection contains works by: Tim Ford, Amanda Clark, Laurel Anne Hill, K.H. Vaughan, Crystal Koo, Brent Nichols, Julia A. Rosenthal, William H. Keith, Shen Braun, Jennifer Rahn, Emily Mah, Frances Pauli, Camille Alexa, Tim Reynolds, Ray Dean, Frank Larnard, Derwin Mak, Nick Tramdack, and Minsoo Kang. I dunno, being bilingual and binational is pretty darn cool!